Rubber stamping on dominos is a fun and fairly easy stamping project to make jewelry or pendants. 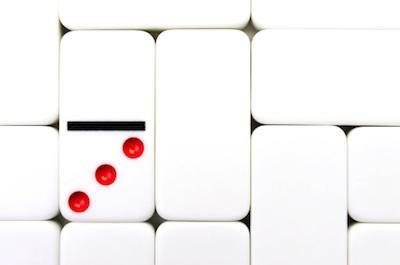 Dominos from the domino game are used for rubber stamping. Dominos come in varying sizes, but generally they are a one by two-inch rectangle. Other sizes of dominos are also fun to work with, such as mini travel domino games. The colors for dominos are usually white or ivory, and they are made of hard plastic. Look for a smooth, heavy, quality-made domino with rounded edges. Most major shopping centers and toy stores have domino games for sale for less than $5.00. Shop around until you find the color, size, and quality of domino you like. Keep in mind that domino games are inexpensive and you get 28 in the box, so you won't be out a lot of money while you are learning this new craft. To make your domino into a pendant or a piece of jewelry, you need to drill a hole to hold the wire, elastic, or necklace. What you are making will determine where the hole will be. Generally, to drill the hole you need a very thin drill bit with a Dremel and stationary press attachment to hold the domino still while drilling. Another method for holding the domino still while you drill is just using a vice clamp. Clamp the domino down and drill slowly through the plastic. For necklaces, earrings, and pendants, all you need is one single top hole. For bracelets, you need to drill two lengthwise holes through the skinny sides of the domino. The backside of domino is the side you will be stamping on, unless you want the little black dots as part of your design. Sand the surface of the domino that will be stamped with a very fine grit sandpaper (400 grit). Use a circular motion when sanding, and do not leave any noticeable bumps or abrasions. Wipe the domino off with a clean paper towel dipped in rubbing alcohol to remove any dust. Any type of rubber stamping on dominos will work, if it fits on your domino. If you have a stamp you really want to use but it is too large, you could try stamping only half the picture on one domino and the other half on the next domino. Purchase rubber stamps at craft supply stores. Some artists paint their domino free style and forgo the rubber stamp. You can leave the domino white or stamp it with colored ink, creating a colored background. When you do stamp your domino with the final stamp, press straight down and be careful not to let the domino slide. Dominos are slippery, and you will want a crisp design, not a smudged one. Use a permanent marker to touch up your stamp or add accents where you want to your image. There are several types of ink and paint that are effective in rubber stamping on dominos. Some artists prefer alcohol ink, and others prefer acrylic. The colors are limitless, including crackle paint and metallic paint. Use a flat rubber stamp to paint or stamp the domino top and sides with a background color. Dab several colors together for dimension. After you have painted the domino with a colored paint or ink, apply heat with a blow dryer according to the ink manufacturer's instructions. The idea is to heat up the ink so it will set without blistering. Allow the background paint to dry completely, or it will lift once you ink up the rubber stamp. Use black or darker ink on your stamp pad for the image. The ink needs to be sealed so that it will not scratch off the plastic domino. Using a lacquer spray or a mod podge gloss sealer, spray or brush very thin layers of lacquer onto each domino. Be careful to avoid creating bubbles on the surface. At this point, you can sprinkle a glitter onto the lacquer if you want a sparkly effect. Rubber stamping on dominos enables you to make some really unique pieces of jewelry. To make jewelry from the dominos, use the same general techniques you would with plastic beads.